Kite boarding is an EXTREME Sport! Would you learn to skydive with an uncertified instructor? No you wouldn’t … So don’t learn to kiteboard with anything less than Certified and Experienced instruction. How do you know your getting a SAFE and productive kiteboarding lesson? Make sure your kiteboarding School is honest and transparent with their credentials. Make sure they’re Certified … ask to see his instructor certification card and notice the date he became an instructor. If they are certified , they will have a valid card from the certification agency (IKO or PASA) . You can also look them up on the certification agencies web site, and view how long they’ve been teaching, and even how many hours of instruction they have taught. Make sure they have a business license … ask to see his city business license. Make sure he has insurance to teach kiteboarding as a school … insurance to teach for other schools is not insurance to teach as a school … don’t get scammed, ask to see his school insurance binder. See if your instructor make you sign a waiver and medical statement with their name listed on the waiver? If not, find a real instructor. Make sure your instructor provides and/or requires all essential safety equipment for your lesson? Helmets, CGA life jacket, kite leash, protection against the hazards, like booties and wetsuit? Do make sure your instructor has an assortment of kite sizes and boards to match your needs and various wind conditions. Don’t take kiteboarding lessons with a particular instructor /school, because they are cheaper. Don’t believe everything see … ask for proof. Don’t forget, you are learning and Extreme sport. Don’t let your instructor tie you to himself or another object with a rope, leash or other system ? They will be endangering you and they are obviously not a legitimate instructor. If they’re certified, they are violating safety standards and unsafe to teach this sport to anyone. Don’t let your instructor use a board leash to tether you to the kiteboard? If so, they are violating well established safety standards … board leashes are band by all kite certification agencies. Don’t let your instructor send you into or towards other riders or into other water users. Beginners must learn downwind of others. Don’t endanger yourself or others, by learning unsafe practices from unsafe instructors. Don’t waste you money on unsafe, inexperienced and/or illegitimate instruction. Don’t forget: 1 good lesson is safer and more productive than a 100 bad lessons. Don’t learn from friends or other kiters. Anyone can make a website that falsely states they know how to teach kiteboarding. For your own safety and/or the safety of your children … don’t blindly trust that … check them out. Asks questions and get proof. Manta Water Sports is the only IKO & PASA certified lesson operator in San Diego. We are the only operation that is insured to teach kiteboarding as a school. John Arthur (Founder and Chief Instructor) has been teaching this sport since 1999. He has thousands of lessons, and thousands of hours, teaching this sport safely. Be safe and wise with your money …. take your lessons from Manta Water Sports. Your safety and the safety of others is our #1 objective … It should also be yours. Links to Kite instructors around the world. Note: Most instructors are not business owners who teach. Most are just part time instructors who occasionally work for a school. San Diego is a great place to take kiteboard lessons. We have light winds that make learning to kiteboard more forgiving and safe. We have several, ocean and bay, riding areas to choose from when you become more skilled. Manta Wind &Water Sports teaches kiteboarding all year, and most days of the week. We provide all the equipment for your lesson, even wetsuits, booties and safety equipment. Manta Wind & Water Sports is the only IKO and PASA certified kiteboarding operation in San Diego. We are the first kite school in Southern California, and we have maintained a 100% safety record the entire time. Reserve you Kiteboard Lessons with Manta Water Sports, and learn quicker, safer, and with a lot more enjoyment. We offer Private, Semi Private, and Group lessons. We offer Equipment Deals to our students, that can save you more money, than the cost of your lesson. Learn from the Best, and enjoy this sport, with family and friends, for life. Located in San Diego, California. 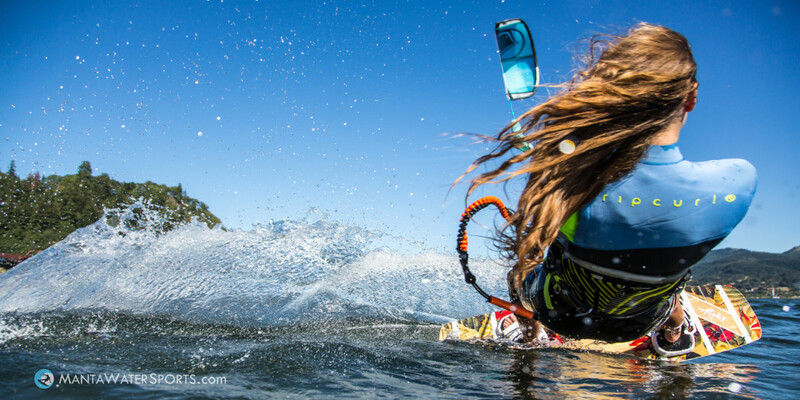 Give the Gift of Kiteboarding Lessons and Gear! Manta Wind & Water Sports is open for Lessons and Equipment sales during the holidays. We specialize in teaching you how to be independent and self sufficient, so you can practice on your own right away. Sign up for the Discover kiteboarding Lesson today and Receive the student discounts on Equipment you purchase from us. Kiteboard Lesson Gift certificates are the perfect gift for those loved ones who love adventure sports. Kiteboard / Kitesurf Lessons Now ! The Best time to learn to kiteboard is now ! Take your kiteboarding lessons now, and learn while the water is still warm, but the summer crowds are gone. Manta Wind & Water Sports offers kiteboard lessons all year, and the best time to learn is when the summer crowds have gone. The waters are still warm, and the beaches are uncrowded. Take your kiteboard / kitesurf lessons in November, December, January, or February and be riding long before the spring and summer season hits. This time of year is also a great time to get a head start on training before you head off on those holiday vacations. Manta Water Sports , offers beginner through advanced levels of instruction every day of the week and all year. This time is year is great time to purchase kiteboarding equipment , as we offer the best deals on kiteboard gear now. We sell the top brands of gear at the lowest prices allowed. We provide all the gear during your lesson, including wet suites, booties, lifejackets and radio helmets if you need them. Get the safest and the most comprehensive training available. What is the Best Foilboard to Buy? I really did learned to get up and ride the foil board in just one day, using the 2017 Happy Foil. I decided to maximize his success by installing Liquid Force’s optional “Low Aspect” front wing onto the Happy Foil fuselage for initial training. The LF low aspect wing has a track record of making foil boarding easy. The Happy Foils stock Medium Aspect wing would be used after I get the feel for foil boarding … this proved to be a great path to success. Day 1: I set the foil mast to the rear position on the board, and used the 1.5 degree, rear wing trim plate. After 5 minutes of riding the board flat on the water, I was up and riding the foil for short distances, all within 15 minutes of water time. After about 30 minutes, I was able to ride longer distances and gently stop. By the end of my 1 hour session, I could ride in either direction for 3/4 of the length of the bay. (Wind speed was 8-13mph with a 12m kite). Day 2: I was dialed into getting up and riding in either direction for the full length of the bay, and able to go up wind and downwind with ease. Still working on making transitions. (Wind speed was 8-14mph with 12m kite). Day 3: I switched to the Happy Foil’s stock “medium aspect” wing on the fuselage, and had no trouble getting up and riding the foil. Able to go much faster and perform carving upwind and downwind turns. Still working on making complete transitions. (Wind Speed was 7-12mph with a 12m kite). Summary: The Liquid Force Happy Foil was the easiest, and most adaptable foil, we have ever tested … We give it a 5 star rating! 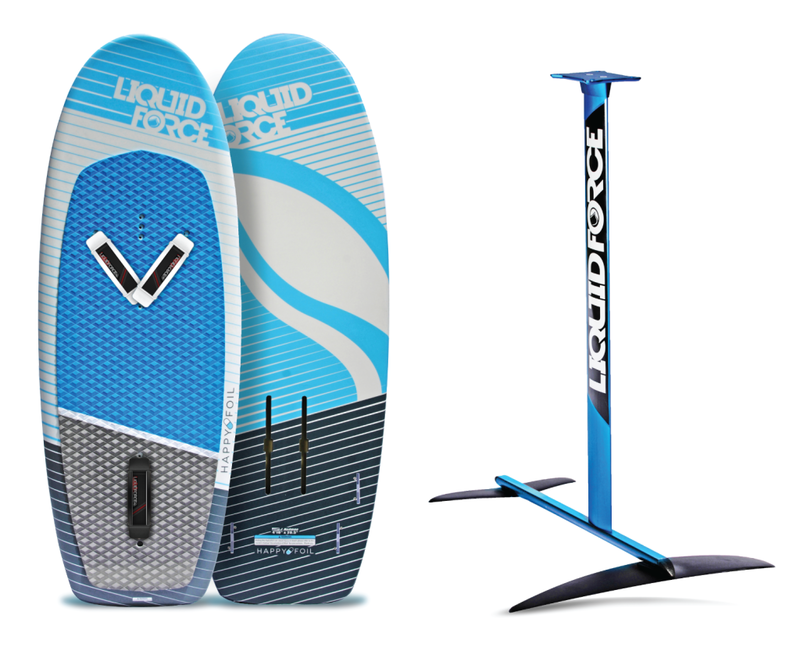 If you want a foil board and foil set that you will be hard pressed to outgrow , and a foil set that could last you a lifetime without worry … get the 2017 Liquid Force Happy Foil from Manta Water Sports, and feel the freedom to expand this system with your desires. Optional Accessories: Low Aspect Wing / High Aspect wing / Carbon Fuselage / Short Masts / Trim plates / Board options. Get your 2017 Liquid Force Happy Foil Today. Manta Water Sports Teaches Kiteboarding All year. 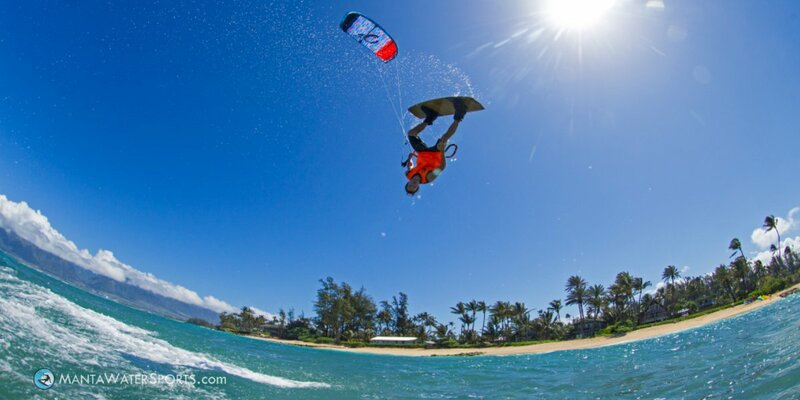 Sign up for you kiteboarding lessons today and enjoy this amazing sport. Beginner lessons from 11am-3pm every day of the week. We offer : Private , Semi-Private, and Group lesson options. We povide all the equipment during you lesson. We offer student discounts on new gear you purchase. Light winds got you bummed ? Light wind equipment is the ticket to you happiness! Kites like the liquid force solo and the cabrinha contra have made it possible to kite in as little as 8 knots with a twin tip. Boards like the Liquid Force Happy Pill along with the Happy foil system have made it possible to kite in as little as 7 knots with the solo kite. Book a 2-hour Customized Lesson and learn how to ride the board like a pro. This private performance based intermediate level kiteboard lesson teaches you the tips and tricks used to get you up and riding the kiteboard quickly and easily, even in light wind. 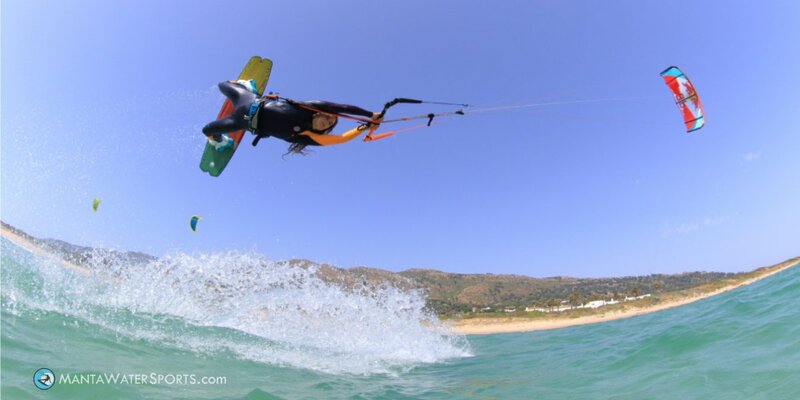 It's the perfect lesson for continuing students or the novice kiteboarder looking to enhance his or her riding ability and/or improve their kite/board handling skills. Also perfect for those people who had previous lessons , but could not quite ride the board. This is primarily a water based lesson, but you must demonstrate you are skilled enough for this lesson, and exhibit safe control of the kite, prior to the start of water skills. Student discounts on most equipment items we sell. This session teaches you the 4 most common mistakes beginners make when try to water start. You will also learn bonus tips to let you ride in light winds. You will practice the water starts, Board riding and speed control while maintaining proper balance and board position for efficient riding. This session teaches you how to stop yourself and control your speed using the kite and board. You will also learn how to plan for, and perform smooth turns, that keep you safe, in control and styling. Note: Yamaha Wave Runner support may be available for selected in-water training sessions. It must be requested in advance and an additional cost of $50/hr must be paid in advance. Are you ready to try Foil boarding? Yes ... We can provide the Foil board during the lesson ! If you are an intermediate, or higher level kiteboarder, you are ready to learn to Foil Board. The newest Foil boards can ride in as little as 6mph and easily stay up wind. Add foil boarding lessons to your skill set. Manta Wind & Water Sports, now offers beginner foil board lessons and rentals, to intermediate level kiteboarders and higher. Take our 2hr private foil boarding lesson first, then rent or purchase your foil board from us and you'll be riding in a few sessions. Note: You must be proficient at kite control, board transitions, basic jumps, and self rescue before taking this lesson. Your body dragging skills must also be top notch, to handle this lesson. Be prepared to spend several minutes just getting used to how the board is handled on land and in the water before you attempt your first ride. Foil kiteboarding is not as intuitive as it looks ... but its also not hard to learn. We use the newest and easiest to ride hydrofoil system on the market to get you up and riding faster and with less frustration that possible with other systems. Manta's Foil board lesson does offer you the basics in handling , safety and successful riding. Then you can make an informed decision if this is for you before you drop the funds purchase your own foil board set. We can provide all the gear during the lesson, however, it is suggested that you use as much of your own equipment, since those items are a factor in your overall comfort and performance. Warning: The hydrofoil system does contain sharp and ridged edges. This poses a higheer risk of injury to you and others. By taking this lesson , you agree to accept these added risks and liabilities. The Light Wind Style class is a MUST for any beginning or intermediate level kiteboarder that wants to learn the special techniques used to succeed in "Light Wind" environments. Kiteboarders that come from stronger wind environments will find the techniques they were taught, won't work in light wind conditions. Novice kiteboarders who are frustrated with learning to ride will benefit from this class as well. We wrote the book on light wind kiteboarding .... we call it "Light Wind Style". We have been teaching in light winds for over 14 years, we know what it takes to Ride, Jump and Stay upwind when others can't. This is a one hour "land based" lesson that will teach you "Light Wind Style" and theory. All of these techniques are presented and practiced on land, so you can later succeed in the water. We highly recommend you bring your own kiteboarding equipment and harness to this lesson. We want you to learn these skills with your equipment to gain the most benefit. Not sure if this class is for you? Do you have trouble keeping the kite flying? Do you wonder why you can't ride? Do you think there is not enough wind? Do you come from a strong wind environment? Do you feel like your board keeps sinking? Do you have trouble riding upwind? Does your kite constantly fall from the sky? Do you think you have the wrong kite? Do you have trouble relaunching your kite? Do your jumps land with a splat? Then this is the right Lesson for You!